When it comes to decorating with stone tile, marble ranks at the top as the number one seller. Marble is the most sought after building material amongst builders, contractors, architects, and designers. This uniquely colored mineral not only emanates a certain elegance in décor, it also is a durable and may very well outlast anything else in the build that isn’t stone! As a builder and contractor, the best way to stock your inventory is by buying low and selling high. For wholesale, the more marble tiles you buy, the lower the unit cost will be. The only downside to buying your marble tile at wholesale prices is that you’ll be spending more money upfront. This means that even though you are getting your marble tile at $1.95 per square foot, in order for your wholesaler to honor that price, you’ll have to order a bulk amount of tile—in fact, you’ll have to order an entire crate! You better have somewhere to store all of that tile! That storage space had better have the capacity to store a bulk amount of tile and have a dock to receive it all. The upside to buying by the bulk is that as a builder, you will always have a sufficient supply of marble tiles for any given project. Gone are the days of running to a tile distributing company on an as-needed basis. Buying your marble tile from your local home improvement store only when you need it may work for some of the smaller businesses, but for companies that are fulfilling multiple contracts, the importance of having certain type of marble tile on hand ready to ship out to the building site can be the difference between completing a project on time to acquire another contract and missing the deadline, thus missing out on the opportunity to make more money on the next building contract. Understandably, there might be some apprehension when it comes to ordering a bulk supply of anything, especially when it comes to ordering marble tile. There are so many variations of marble tile, that it might be a little difficult to determine what people will prefer the most. Marble isn’t like linoleum where, if you don’t like it, you can simply peel it away and replace it with another color. Marble is a rock. If you are installing a rock into a build, sure you can replace it if you want to, but it’s not going to be a simple process, which means it’s not going to be cheap either. So when stocking your tile inventory with marble tile, it is highly recommended to stock the kind that is the most popular in the builder’s market. If you are lucky enough to find the right marble tile wholesale distributor, they will have already done that for you! Wholesale distributors are just like you. They want to move their inventory too! A good wholesale distributor will not only encourage you to buy as much of their inventory as possible by reducing the unit cost, they will also offer extra perks like giving away a free samples to serious buyer. This helps you as the buyer be more secure in knowing exactly what you are purchasing. Collecting free samples also offers you as a marble tile distributor the opportunity to compose a collage of marble samples to show your clients the type of stone your business provides. Obtaining marble tile samples can also be used in other ways. For interior decorators—or building companies that provide the services of one, can pair their free marble tile samples with other materials that will decorate a space. Swatches of wallpaper, curtains, upholstery or rugs will help clients get a better visual of what their space can look like. It’s no question with marble tile, the more you buy the less you’ll pay, and you don’t have to commit to just one type of marble either. These days, builders are incorporating more than one style of tile into their build. Whether it’s for design purposes or used for defining a space, selecting the right combination of tile for your inventory is always helpful. Again, the color variation of marble differs, but being able to stock 3 – 4 different crates of marble tile will give your customers enough of an option. 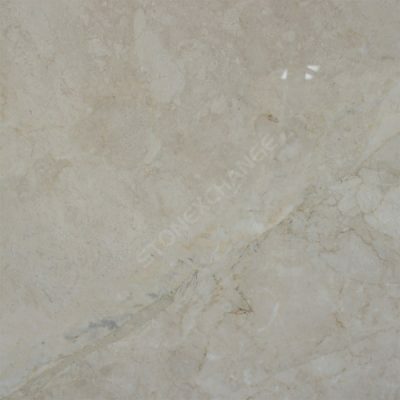 When buying different marble tiles at a bulk rate, it is recommended to stock the kind that will contrast one another. Of course, depending on the scope of your project, it might be necessary to buy just one color. For the smaller projects, it would be most beneficial to purchase an extra crate of a contrasting color just for inventory purposes. This way, you are slowly building a good inventory of marble tiles. Some of the most well known marble tiles are Adalia Cappuccino and Crema River. The Adalia Cappuccino gives a warm, cozy ambiance to a space while the Crema River can easily brighten small spaces. For grander areas of square footage, both tiles can be creatively installed to designate one space from the other, making oversized rooms look less vast. For a list of other stone tiles that are available to you, click here. To your clients, you are the expert. That means you will be expected to know everything about marble tile. Marble wholesale distributors understand that you just sell the material—you didn’t make it! With the right marble tile wholesale distributor, you’ll soon become the expert too. Before purchasing your inventory of marble tile, be sure to write down a list of questions that you would anticipate your customers asking you and then ask the customer service representatives at Nalboor Tiles. Seeking an Informative Wholesale Distributor? Nalboor Tiles offers free samples of all of their marble and tile products. We are located in South Florida near the port of Miami. This means that we are able to receive an abundant shipment of the finest marble tile and travertine to stock in our warehouse that’s ready to ship out to you at a moment’s notice. Do you have any questions regarding stocking your inventory with the finest marble tile? Contact Nalboor Tiles online or call us direct at 305-501-4549.